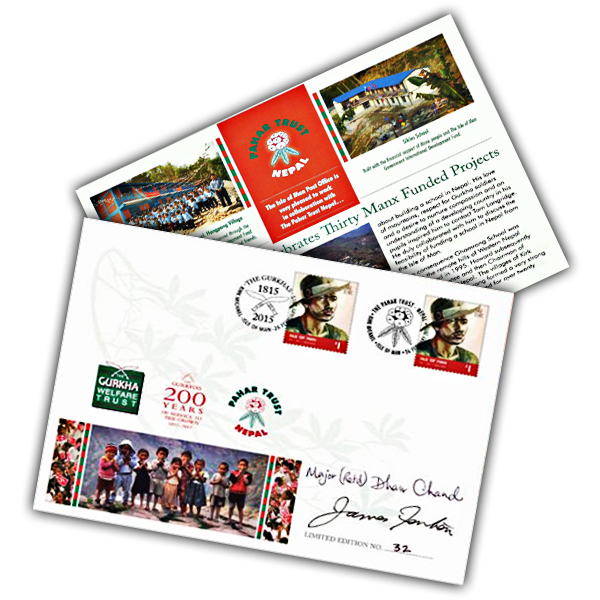 Isle of Man Post Office is very pleased to work in collaboration with The Pahar Trust Nepal to celebrate thirty Manx funded projects with a special cover in recognition of the long standing reciprocal links the Island has with Ghamrang, Nepal. This special cover features a portrait of a Gurkha by WWII veteran James Fenton, a double cancellation from Kirk Michael containing a Nepalese rhododendron and crossed kukri (the national weapon of Nepal) and is accompanied by an illustrated information card about PTN history and projects. The plain cover is limited to 200 items and the signed cover, signed by retired Gurkha Major Dhan Chand and artist James Fenton, is limited to 300 items. A donation will be made to The Pahar Trust from the sale of each cover.